Note: This is not a word-for-word transcription of the final episode, due to technical difficulties. However, the information is the same. I’ll update it with a more normal transcript soon. On today’s episode, I’ll want to give you a taste of new feature I’m thinking of adding to the podcast this year : the working title of it is “fun finds”. Hi everybody! Today is going to be a quick one, I’ve been a bit under the weather fighting a nasty cold virus for most of January. This short format episode is a new type of episode that I want to try to add to the podcast going forward as a regular feature. I like to think of as “fun finds”. Now I should probably first example that one of the ways my husband, Chris, and I find new early women photographers names is to find examples of their work in an antique store or on ebay. The hunt usually involves looking at dozens and dozens of photos, either piled in boxes (in a store) or and then plowing through ebay listings online. We’re looking for names of early women photographers are either obvious (eg. Mrs. or Miss or Misses or “Sisters”) or else names that aren’t obviously women that appear in our database of names of the women. Our database combines two lists; one is a list of 1000+ names that Chris and I have done at least a little bit of research on and ttwo is Peter Palmquist’s database of over 19,000 early women photographers from the U.S. that we’ve done at least a little bit of research on to date. Anyway, it can sometimes feel like quite a slog when you’ve looked and looked through photo after photo and you haven’t find anything on the hunt that day. But then .. when you do find one, it’s always a good day. And when you find something you never thought you’d find, that’s even better. So today’s fun find is an example of a work by a photographer we’ve already met here on the podcast. We first ran across her in an antique store in Loveland, Colorado – we had zoomed to get there before they closed one day when we were driving back east across the U.S. But there, in the the 100s of photos that confronted us, where photos by Mrs. B. B. Chase. Belle B. Chase, of course, was one of the examples I used in my conference talk that was in the last episode. And in episode 22, you’ll find more information about her fascinating life and long career. And the episodes notes for episode 22 include those first photos we found by Mrs. B. B. Chase in Denver. But Belle’s career actually started before she married D.B. Chase and moves to Denver, Colorao. Belle was from the mid-west, and she ran a studio as a young single woman, wunder her maiden name, Belle Bybee in Harper, Kansas. She only ran that studio for a short time circa 1887. She took out ads in the Harper, Kanasas directories from that period, but we figured – what were the odds of findin example of work from the Belle Bybee studio in Harper? 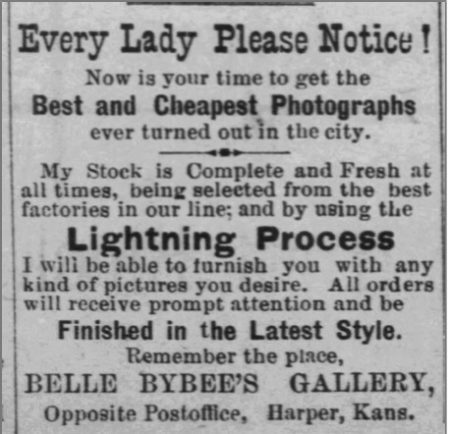 Well, it turns out, better than we thought, because this month we actually found a cabinet card for sale on ebay by Belle Bybee’s studio in Harper, Kansas. 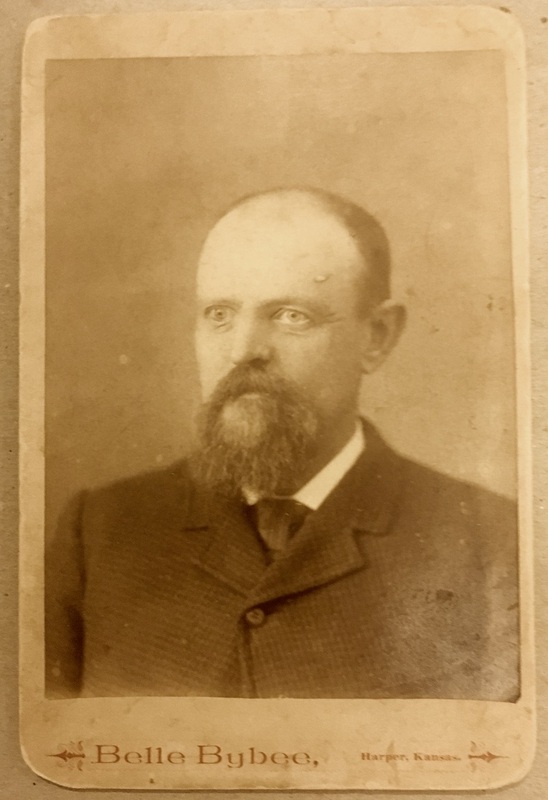 It’s a standard cabinet card head and shoulders portrait of a balding man, sporting a tie, coat and white color, and a bushy goatee. He is staring straight ahead; the photo is a bit faded, but his pupils are remarkably clear, to the point that it almost looks like they could have been painted in. (That was possible to do some touchups like that, even back circa 1887 – recall we saw some color touchups in the photo by Mrs. Lydia Hicks a few episodes ago). So, we now have an example of Belle Bybee Chase’s work from the start of her career. A ‘fun find’indeed! If you have any questions or want to drop me a line, send an email to podcast “at” p3photographers.net. Also, remember you can follow Photographs, Pistols & Parasols on Facebook at facebook.com/p3photographers.